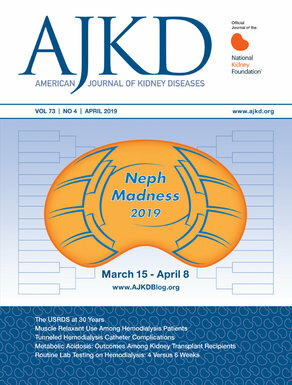 NephMadness is an homage to the NCAA Basketball Tournament, March Madness, but while the basketball tournament seeds the top ranked basketball teams, we use some of the most important, newest, and controversial concepts in nephrology. This is not nephrology 101, You won’t find hypokalemia, loop of Henle, or Winter’s formula here. We expect that some of the concepts will be novel, even to academically minded nephrologists, so we provide deep, fully referenced, guides to each of the concepts. How do I participate in NephMadness? We think the best part of NephMadness is when people take to social media to cheer their teams on. If you have a blog, write about your choices, if you are on Twitter, use #NephMadness to tweet about the game. The winners of each match are determined by a Blue Ribbon Panel of judges. It is a mixture of training program directors, renal physiology/pathophysiology instructors, and journal editors. The Blue Ribbon Panel will determine the winners of each matchup by the March 23rd deadline for entering the contest. There are prizes. One copy of Brenner and Rector’s The Kidney, 10th Edition, will be awarded to the top overall score. One copy of National Kidney Foundation Primer on Kidney Diseases will be awarded to the top medical student score, top resident score, top fellow score, and top attending score (first registration question must be answered for prize eligibility). Additionally, a NephMadness water bottle will be awarded to (after excluding the scores of the grand prize winners) the 9 remaining overall top scores, best tweeter, and the best blogger. The official rules of NephMadness 2016 are available for the legally inclined. Most importantly, it is free to play. Why is there a NephMadness? The creators of NephMadness wrote an editorial last year in AJKD, take a look at it. We see online social media as a major game changer for medical education, but at the same time we see a significant barrier to getting started. When you are new, the social media space can be a bit bewildering. The idea was that a game may bring some purpose and focus for nephrologists trying to explore social media. This is intended to be fun. The scouting reports we create with our selection committee are intended to orient players to all the concepts that populate our field. They are fully referenced and are a great place to start your research but they are in no way comprehensive reviews or book chapters. Additionally, though they have been proofed and edited by our experts, they are written by general nephrologists and research nephrologists, but out of their core area of expertise. We are sure there are mistakes. If important and worthy studies are overlooked contact us by making a comment or tweet the mistake. If we could add a Wikipedia-like EDIT button we would. We want to make the content better and are delighted to fix any issues that are discovered. The purpose of NephMadness is to learn, share, teach and most importantly have fun. We hope everyone has as much fun playing NephMadness as we did creating it. Enjoy NephMadness 2016!